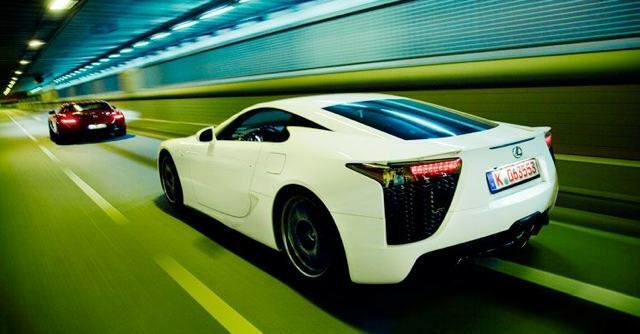 The Lexus LFA and the Mercedes-Benz SLS AMG are about as different in approach and ability as a muscular sprinter is from a sinewy long-distance runner. It’s a clash of characters along the lines of a Suzuki Hayabusa sportbike taking on a BMW K1300S, a Moog synthesizer compared with a Steinway piano, or techno music as opposed to Beethoven. The LFA is a limited-edition, high-tech item that is heart-stoppingly pretty and very nicely put together, a street racer for track days and early Sunday mornings. The SLS is a powerboat for the road, a mighty mauler that evokes fond memories of a brand’s glorious past, a surprisingly practical and highly visible tool for the dedicated driver. Both cars are honest and straightforward, classy and competent, intriguing in the way they present themselves and perform, dynamically focused, and deeply rewarding. The final choice could come down to personal preferences, such as the more modern Lexus exterior and interior or the more practical packaging of the Mercedes. There’s certainly a clash of ideals at work between these two supercars, and it’s one that Mr. Kacher manages to capture perfectly. No matter the cutting-edge technology that powers the SLS, the supercar has a decidedly retro appearance and draws (perhaps too) much of its character from the 300SL Gullwing, whereas the LFA is unlike any other vehicle on the road, and it’s that difference in philosophy that stands out the most when they’re put side-by-side.